Many of my most popular fantasy cat images are licensed on these wonderful products. 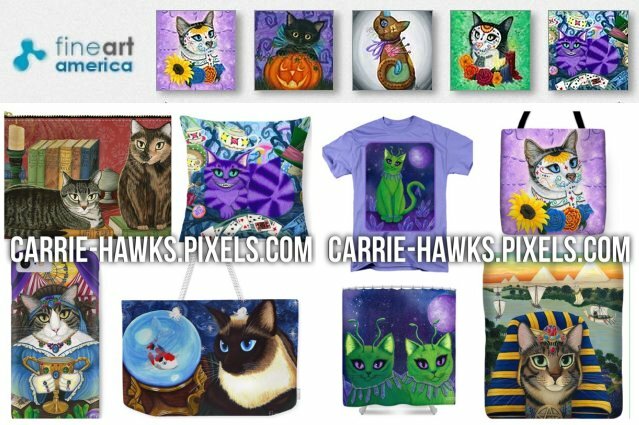 Please browse these great companies below to purchase more merchandise featuring my artwork. ( The companies below are not part of Tigerpixie.com. Items purchased at the sites linked below will ship separately from other items ordered from my website. TigerpixieArt Zazzle Gallery for my Fantasy Cats! Zazzle is a wonderful on demand printing company that enables me to share my artwork on many products and gift items. 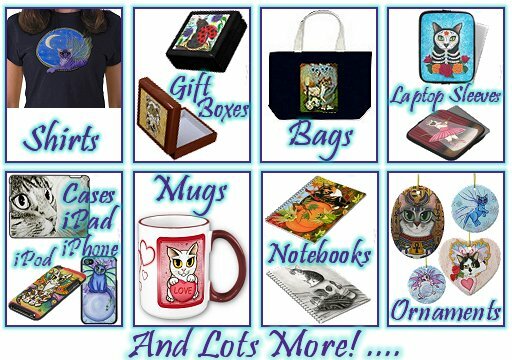 My Fantasy Cats are now available on, T-Shirts for Adults & Children (Over 100 styles & many colors), Mousepads, iPad and iPhone Cases, Sterling Silver Necklaces, Mugs (Over 30 styles Coffee & Tea, 11 oz & 15 oz, Steins, Frosted Glass ), Postage Stamps ( Real USPS Approved Stamps ), Greeting Cards & Postcards, Tote Bags, Aprons, Posters ( BIG Posters, Framing available too ), Pin Back Buttons, Magnets ( Round & Square ), Stickers, Keychains & Lots More! My Tigerpixie Etsy Shop featuring my fantasy cat art & gifts. I have been selling to cat lovers on Etsy since 2006. Tigerpixie counted cross stitch patterns at Heaven & Earth Designs! These patterns are not computer generated. Each pattern image is painstakingly hand graphed using engineering software for an underlay, thus producing a relatively clean chart with minimum "confetti" stitching. All charts are offered in two formats - one which is regular format & a Large format for the chart that is easier to read. They are all available for purchase in both "Snail-Mail" or E-mail format. carries High quality prints and greeting cards of my most popular fantasy cat images. Imagekind has all sizes of prints to pick from. Also your choice of different high quality papers for both prints and greeting cards. Custom framing for your print is also available too.